Refresh your business routine at the Courtyard Ewing Princeton where stylish hotel rooms are complemented by a warm and inviting lobby so guests can enjoy greater flexibility and room to roam. 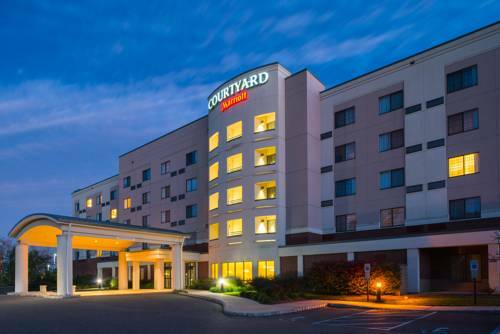 Conveniently situated next to Trenton Mercer Airport, our hotel's location puts guests just minutes from the College of New Jersey, Princeton University, Rider University, Sesame Place, Sun National Bank & the New Jersey cities of Pennington and Princeton. Our inviting lobby features spaces to work or relax, free Wi-Fi, & easy access to the latest news, weather and airport conditions via our GoBoard technology. The lobby also features The Bistro, where guests will find a variety of breakfast and dinner options, an evening bar, and specialty beverages made with Starbucks coffee. Located just steps from Trenton-Mercer Airport, our hotel is easily accessible for business and leisure travel in Ewing. Our free shuttle service is provided by reservation request within five miles of the hotel. Your food & beverage destination for refreshing breakfast choices in the morning and a variety of light dinner options and cocktails in the evening. The Bistro also offers specialty beverages made with Starbucks coffee to help you get a jump on the day. Pet a hissing cockroach and skeeve at a demonstration kitchen, sealed in plexiglass, that's been deliberately infested with roaches. The head of a tough-as-nails Civil War horse, exhumed from the grave, still on display. Expedition leader Robert Peary used to get all the credit, but Matthew Henson is honored with a statue acknowledging he was more-than-likely the first explorer to set foot on the North Pole.